We like our heroes strong, handsome, and sometimes just a little bit bad, but they have to be kind, caring, and loving. Our heroines fall for our alpha males without hardly needing to think about it at times. These men exhibit huge amounts of good character, make passable decisions, and if the choices they make turn out badly, then they don’t hesitate to apologize. They treat women with respect and do everything in their power to protect them. But do we make it impossible for the REAL men in our lives to live up to the standards set by our faux heroes? Truthfully, many of my heroes are based off my husband. He’s definitely an alpha male. Type A personality. Leader. He can walk into a room, and people notice, even if he says nothing. Some of that comes from his size (6’4″ and not skinny(anymore LOL) — I’ll be nice and not share his actual weight), but some of it is because of how he carries himself. The night before our wedding. 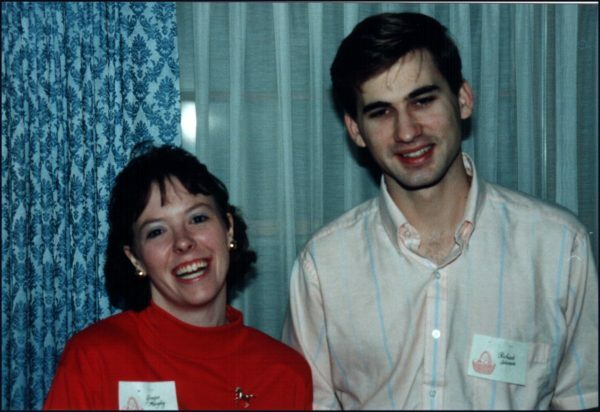 We were so young (and skinny). The problem lies in that he is not perfect. He does make mistakes. On the personality spectrum, him and I are almost total opposites. And sometimes, that leads to misunderstandings. I don’t think like he does. And he doesn’t think like me. When I’m reading, I sometimes think to myself, “Why don’t they just sit down and talk about it?” But sadly, that doesn’t always work. Sometimes the hurt goes too deep, even if what the other person meant was not how it sounded. I can’t be the only person who’s been there. And yet, sitting down and talking about it is the only way to rectify the situation, to turn the misunderstanding into understanding. One of the rules of writing reminds us that if the characters can sit and discuss the conflict and resolve it quickly, then it’s not a real conflict; it’s a misunderstanding, and the book can’t ride on it for too long. And yet, how long can a misunderstanding last in your house? A certain misunderstanding lasted for SEVERAL YEARS in my house, because I was too hurt to ask about something I’d read in a notebook he kept (by accident, I wasn’t snooping). And he didn’t even know how hurt I was. Sad, but true. When we finally talked about it, he informed me that the hurtful words I’d read weren’t even about me. They were about the wife of a friend he was counseling at the time. But my hurt kept me from talking about it and ultimately, kept me from loving my husband the way I should have. I’m also glad he doesn’t read much, because I wouldn’t be able to live up to the standard of some of the heroines I read or write about either. Hi Ginger, I love this post! I read, (a lot in fact:), and enjoy seeing how an author has constructed the hero. I love that my husband takes pride in what he does- he doesn’t like to put anything less than his best effort in. He is thorough, he has a gift for seeing things from a new perspective and getting me to think things through. He loves our boys, he loves the outdoors and being active and encourages me to do my best. He is a great baker (best cinnamon scrolls!) and takes good care of our garden. I could keep going!! Such wonderful things you speak about your husband, Wemble. That makes me happy. Sometimes we just need a reminder of how blessed we really are, even when they’re not perfect. Those are great traits to look for, Ausjenny. As I tell my daughters, God’s got a man out there somewhere with your name written on his heart. Hopefully someday, he’ll be ready to be everything you need him to be. If there isn’t (because I don’t believe everyone is meant to marry), then He has better plans for you. I fully agree I am 55 and single but content. I wasn’t at 30ish I thought as we are taught in society you have to be married. Churches can be the worst as they tend to make you feel like there is something wrong if you are not married and I hate to say it but Singles in many churches get left behind or forgotten. I know of time when we have had a men’s dinner and a couple of the ladies organized a night out for the ladies only they didn’t invite any single ladies (mainly me) but what was worse one of the organizers did some of it right in front of me and basically said You’re not invited cos you are not married. Its one reason I love books where a heroine or hero fall in love but its come out of the blue and that they weren’t looking for love it just happened. It makes me sad that some people are so … unkind (not quite a strong enough word). I actually feel sorry for them (and pray for them) because they are hurting other people from a place of pain or insecurity. Hi Ginger! Inspiring and thought provoking post. Hubby and I will celebrate our 46th anniversary in June. The trait that I admire most is commitment to me- his wife, his sons, daughter-in-laws, and grandchildren – as a pastor to his parishioners. We enjoy some of the same the same things: neither one of us is in sports or great physical adventures. We enjoy exploring the back roads of Americana – the slower parts of life, small town museums and restaurants. Being in the car together gives us opportunity to talk about life – even though we usually have two very different perspectives. He also supported me to follow my dreams – teachings, taking classes – academically and for fun (cooking), and traveling the world. LOVE is a choice, even when we disagree or life hands us a curve ball. Looking forward to reading the responses. Best wishes. Hope spring is in the air. It’s wonderful that you get to explore and that he enjoys it as well. Happy 46th anniversary (very early, but hey, I’ll forget by then). What an absolutely beautiful post and tribute to your relationship! I just love it! My hubs is a hard working, caring and humorous soul. He always makes me laugh! Isn’t wonderful to have a man that makes you laugh. Mine does, even when he doesn’t intend to. :D And the “dad” jokes. But I still laugh. I love this post it hit every thing on the head . No one is perfect we all make mistakes and sometimes we should talk it out and not keep it to our self. Thanks for great books and give me a place to escape. What I admire most about my husband of 34 years is that he still flirts with me, even though I don’t embrace the same youthful looks/figure that I did when we first married. I also appreciate the fact that he always includes me when he runs errands, knowing he doesn’t even have to ask if I want to join him. Hi, Ginger! I love this post also! 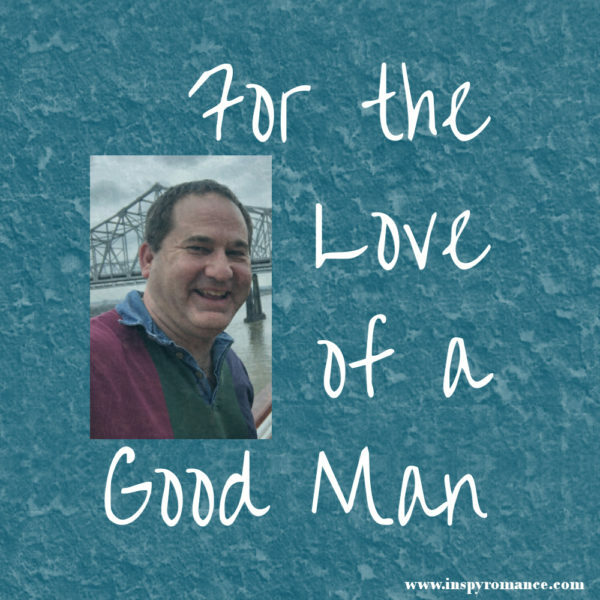 While I love to read Christian or clean romantic fiction, when I start to wonder why my hubby doesn’t match up, I know it’s time for a reality check. I have two choices. I can stop reading for awhile, or I can truthfully recall all the ways my honey has blessed me and that these book heroes are only fiction. ( With some of their foibles, thank goodness!) Blessings to you for reminding us not to hold our husbands to a standard we ourselves can’t meet and God never intended! Thanks, and you’re welcome, Becky. This is a great post. When I was in high school, someone introduced me to sexier (not clean/christian) romances. I read those for years. When our two kids were in grade school full time, I realized what I was doing in expecting my husband to be like these book men without saying anything. Wellll, that was the end of it. I switched to historical/inspirational, and have not looked back. love my husband the way he is. I didnt want to make him into one of those book men. After thinking about it, they are pretty shallow. I love my man who is an introvert, but family comes first. He has so many wonderful qualities that have been so good for our family. He is not afraid of housework. He enjoys cooking. I could do without cooking. He is artistic in sewing and singing and playing the guitar, (electric and acoustic) Sigh. God really knew what He was doing when He put the two of us together. A respectful man who loves his family. A good man with a great sense of humor. I admire how my husband is so caring to people around us and how he truly listens to people (and me!). I also appreciate his sense of humor. Listening and laughing are good qualities to have for a man or a woman. Thanks for stopping by, Ellie. I love the fact that he knows how to do everything “society” expects a woman to do when she’s married. A good husband can do “woman’s” work when necessary. It’s true for the opposite as well. I can drive our tractor, change a tire (maybe the oil, but I’ve never done it), destroy our bathroom (renovations in progress), and cut the lawn (which I actually like), as well as taking out the trash. Oh Ginger what a wonderful post. I was actually thinking about this the other day when I too said I read to escape reality. Reality is pretty good though when it comes to my family. I love my husband, who wrote me poetry, gives me flowers every once in a while just because he loves me (at least once a month, sometimes more), he loves me and our children, he does the dishes pretty much everyday, cooks once in a while (we used to always do it together before we had kids, which he and I enjoy doing together), we compete for who is more a freak to see things organized and in their place, so nothing out of place in bedroom and bathroom (at least not for long if someone slips once in a while)… he listens to me even if I’m mad at him by holding my hand and looking me in the eye when I need to vent or just cry. Just so many wonderful things I probably am forgetting tons about him. Neither of us is perfect but things work quite well. Sometimes just too tired to appreciate.